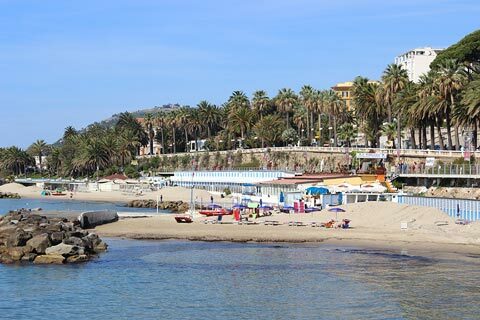 The coastal resort of Sanremo was an important social centre around the end of the 19th century, and a popular resort until the middle of the 20th century, and many of the the grand houses and hotels that you can see in the town date from that period. Italy This Way comment: although the town is no longer the important resort for the rich and beautiful that it once was it is still quite an attractive town to visit, with the faded elegance of the belle epoque villas and a small but attractive historic centre providing much of the charm. The town is in the Liguria region of Italy and one of the most western beach resorts in the country, not far from the border with France. It is correctly called Sanremo although often referred to as San Remo. 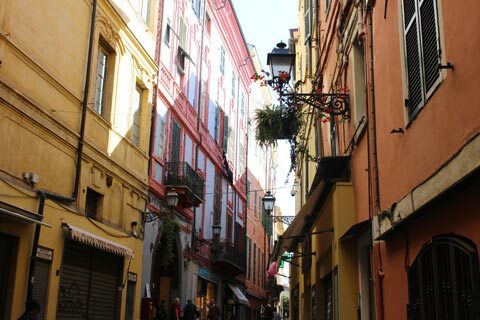 San Remo has a very mild - warm climate because the mountains protect the town from weather arriving from the north, which helps enhance its popularity. Assuming you are not rushing straight to the small beach in the town centre - or you are taking a moment away from the beach to explore Sanremo town - start your visit with a stroll around Porto Vecchio, the old harbour (there is now also a larger more modern harbour in San Remo).This old harbour is quite small, and you can find a few restaurants along one edge of the harbour. 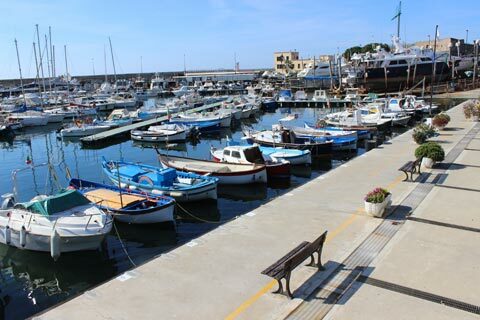 After exploring the harbour area wander along the seafront and the main boulevards in the town centre such as Corso degli Inglesi to see many of the grand villas and their surrounding gardens, many of them still beautifully maintained. The Tourist Office is in one of the most impressive of these houses, the Palazzo di Riviera. Between the harbour and the tourist office you can also see the 17th century Santa Tecla Fort which dominates the centre of Sanremo. 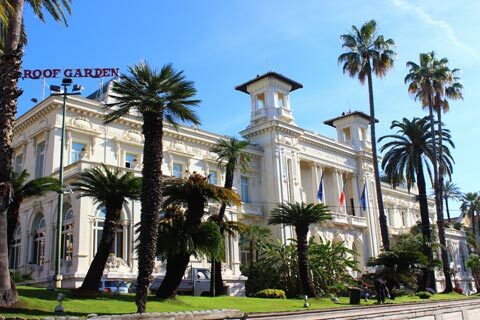 Also in the western part of the town is the casino, the most well known building in San Remo and built in the Art Nouveau style. The casino dates from the period of prosperity in Sanremo (it was built in 1906) and is still a popular destination in the town today. The casino also now contains a theatre and restaurant, while the adjacent Corso Matteotti is one of the main shopping streets in San Remo. 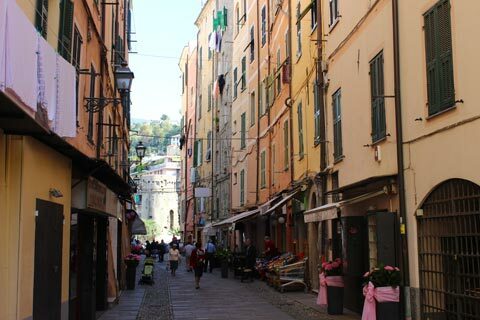 Behind the harbour and just off Corso Matteotti is the medieval center of the town, which is largely pedestrianised and very pleasant to explore with lots of narrow streets to wander through. Known locally a La Pigna (translation: pinecone) this area of tall medieval houses clustered close together along narrow streets provides an interesting contrast with the luxury of the grand villas - and for us was the most interesting part of our visit. 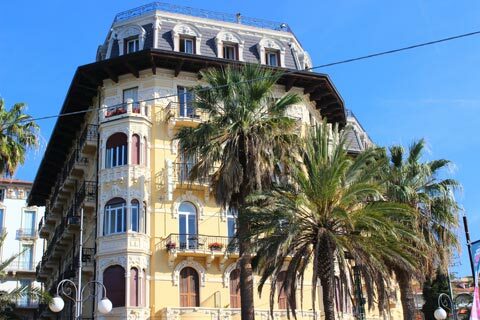 Many of the most impressive villas in Sanremo are to the east of the town centre - you can admire them from the street but they are usually closed to the public. The best place to start exploring is on Corso Felice Cavallotti at the Giardini Nobel, a large and attractive garden just behind the new port area. The large gardens of Villa Ormond are on the other side of the road from here, and are also very pleasant to explore. There are too many of these villas for us to list individually with their highlights here, but you will appreciate their architectural diversity and grandeur and some of the gardens can be explored (the villas themselves are not open to the public). In the Palazzo Borea d'Olmo there is a small museum exhibiting local artefacts and artworks. Among the imposing villas along this road is the one where Alfred Nobel (founder of the Nobel prize) once lived in San Remo, and another where the composer Tchaikovsky lived. 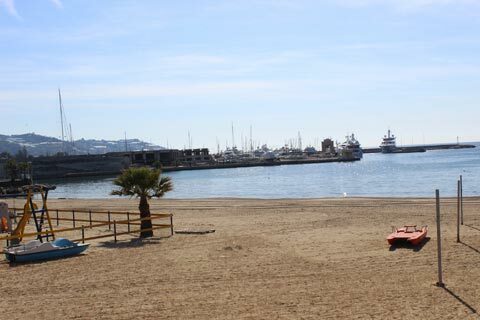 There are a couple of beaches in the centre of Sanremo but these are quite small and most people prefer the beaches outside the town such as those at Bussana, Bordighera and Taggia unless it is for a quick dip! One religious monument here that is interesting to visitors is north of the main centre and is the Sanctuary of Madonna della Costa. This was built above the town in the 17th and 18th centuries and has a decorative baroque style facade. Built on the site of a pre-existing church, the sanctuary has for a long time helped to guide sailors returning to the town across the sea. Another notable religious monument in the town is the Russian Orthodox church - the Chiesa Russa Ortodessia, near the SanremoTourist Office. 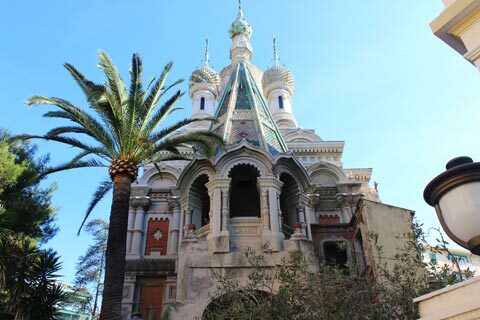 The church was built for the Russians who flocked here as followers of the Russian Tsarina who established herself here during San Remo's heyday. The inside with its Russian icons is the most interesting feature of the church. 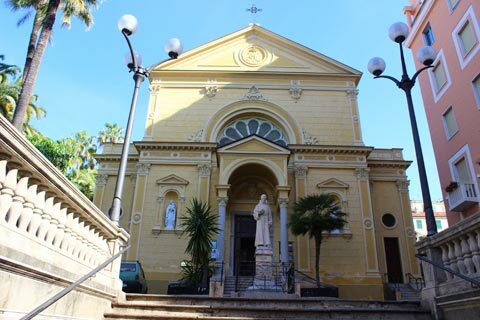 One other important religious building in San Remo is the Cathedral of San Siro, founded in the 12th century although the current roman style building was largely built / reconstructed in the 17th century after damage to the earlier church during a naval bombardment. The town is regularly referred to as the 'city of flowers', celebrated in San Remo on the last Sunday each March with a procession that includes floats decorated with flowers and accompanying music - a lovely time to visit if you live in a cooler climate and want to see a bit of sunshine, but book your accomodation in advance if visiting the festival because many thousands of others will have the same idea! At other times of year you can visit the Flower Market, said to be the largest in Italy. Garden enthusiasts will also find several impressive semi-tropical botanical gardens to visit in the vicinity, including those around the villas. Each year the very challenging and prestigious Milan to San Remo cycle race arrives in the town after almost 300 kilometres of cycling. This takes place on the Saturday closest to March 19, so with careful planning of a two week visit you could include both the cycle race and the flower festival. San Remo is a coastal town on the Riviera di Ponente in the south-west corner of Liguria, 25 km from the border with south-east France. 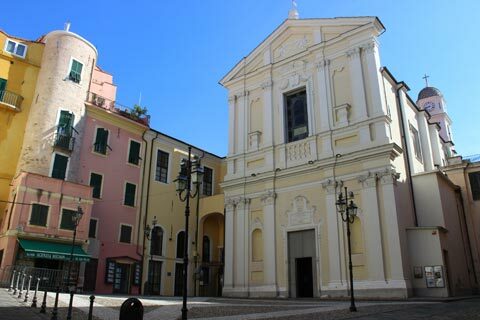 Many visitors like to complete their tour of the town with a trip to the village of San Remolo, a few kilometres above the town to the north-west and with lovely views across Sanremo and the region. One place nearby we found particularly beautiful and fascinating is Bussana Vecchia, a few kilometres to the north-east. This is an abandoned village that has now been taken over by a thriving artistic community and has a great deal of charm and character.